Contemporary and Traditional bathroom in the same space! 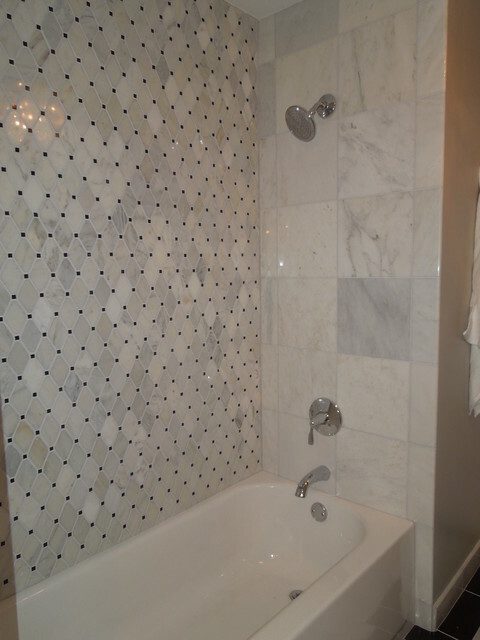 Carrara Marble on floor and bathtub surround. Contemporary crystal sconces and crystal chandelier. Contemporary vanity with white vessel sink on carrara marble countertop. Traditional dressing table with traditional crystal chandelier, crystal sconces and wallpaper. Both rooms are connected by a pocket door. The two different spaces work because of the same tile and color scheme used in both. What is on the wall? - What is on the wall? Whats the name of this pattern? 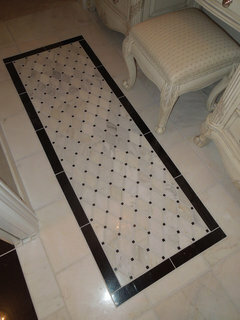 That is a White Carrera marble mosaic with black granite dot, I believe the pattern is call Artois or Octave. I also used it as an "area rug pattern" on the floor in the dressing room.